It isn’t about being funny. 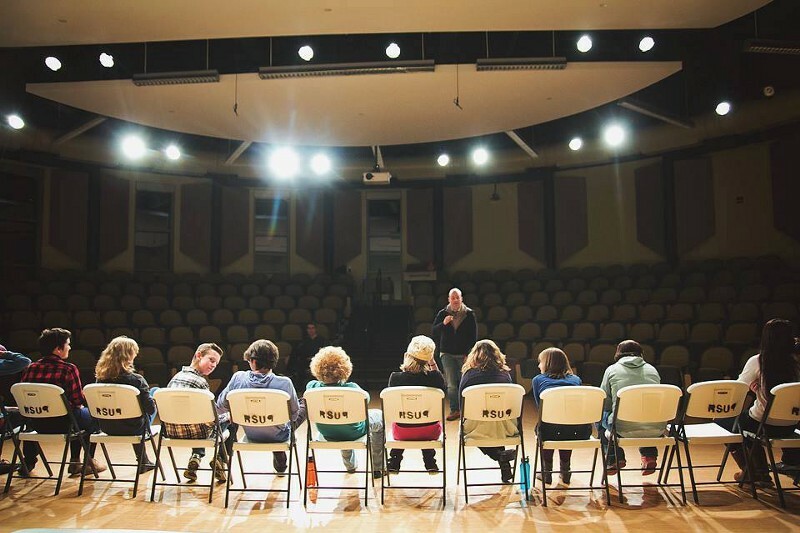 Having directed, performed, and studied improv comedy for the past ten-plus years, with both the young and the old(er), I developed an improv philosophy that serves me well: accept, communicate, trust. I’ve written about ACT before and delivered workshops and keynotes on its effectiveness as a problem solving framework. It occurs to me, as my first week of the 2015–16 school year comes to a close, ACT builds climate and culture just as well. It isn’t about being funny. It is about accepting the moment as given, communicating intention and listening with empathy, and trusting yourself and those around you that everything is going to be all right. Accepting these conditions does not mean we are thrilled about them or endorse them, though it certainly means we devote less energy to grousing about them. It means we can shift our energies to addressing the needs before us and celebrating the opportunities that lay ahead. Acceptance. We must accept the present, the given, the status quo, as delivered, if we then want to grow it, evolve it, change it. The students who come through our doors are the students who come through our doors. Some may carry the weight of endless struggle and others may walk with the freedom of lives unfettered. Some may have tremendous abilities beyond our expectations while others may cause us to scratch our heads and marvel at their resiliency and resourcefulness in getting this far. We may have thirty-five students packed into a box like cord wood and we may also wonder why seventy-five percent of the class dropped and only two remain. We must listen with all of our senses; hear more, voice less. Communication. We communicate in both word and deed, and even then, we are only as successful in doing so as we are in listening to our audience. We must listen with all of our senses; hear more, voice less. After a recent exchange on Twitter about the risks and benefits of sharing syllabi and calendars, guidelines and expectations, classroom rules and grading policies on the first day of school, I stuck to my tradition: save it for next week. Instead, a series of activities and experiences showed students what to expect in class this year and seemed to do an admirable job of imparting my pedagogical approach. Hall pass policies were explained on a case by case basis, so classes could focus on demonstrating their summer experiences in LEGO. Discussion norms were raised in the moment, the campus code — Be Here, Be Safe, Be Responsible, Be Respectful — was explained as it proved relevant, so our limited lecture time could be devoted to explaining the Judaic roots of Superman. And in providing opportunities for students to make and create, to explore and uncover in those first days, I found myself circulating and documenting, taking photos and video, asking questions and hearing their depth of reasoning and understanding. I heard students already getting into big ideas and making epic league connections. Also, I realized just how poorly I delivered a set of instructions, how severely I was shoving some students out of their comfort zones, and how this weekend would benefit from an hour or so of designing some more experiences for my more introverted students to access their strengths. Trust. I would like to think that even at the end of week one, some of my students now trust me. Through acts of doing and discussing, they have learned something about what I value and what I respect, what excites me and what confounds me. And I have been able to provide them critical feedback, to ask questions and encourage new iterations, and to see that not everything worth doing needs grading. They have heard my range of tone, experiencing my sarcasm in a lightweight moment and my sincerity in a most serious pause. They know 85 degrees and no air conditioning frustration and they know riffs on the exceptionalism of Pepsi Max and Coke Zero. I have a long ways to go to build the layers of trust necessary for real authentic learning to take place. This week, a great deal of foundation was laid and perhaps, more importantly, my intentions for the week prevented unnecessary cracks and fissures in this as-of-yet-unsettled firmament. This entry was posted in Accept, Communicate, Evolving Education, Improv, Trust and tagged Acceptance, ACT improv philosophy, Dan Ryder, Education, improv, improvisation, Joni James, learning, Maine, medium, Mt. Blue Curtain Raisers, school climate, school culture, teaching, trust, Wicked Decent Learning by Dan Ryder. Bookmark the permalink.